Are you hoping to learn some interesting facts about the continent of Asia? Asia is so large that it makes up around the third of the entire world’s land mass. The continent is home to many different unique cultures, landscapes, plants, and animals. 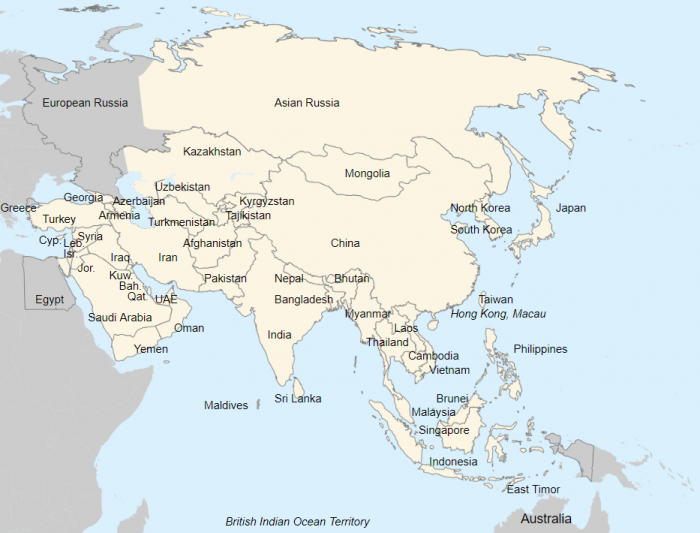 Below you will find a printable blank map of Asia that you can fill in the while learning about the many different countries and locations in Asia. You will also find some facts about the biggest countries in Asia. China is not only the most populated country in the continent of Asia, but it is also the most populated country in the entire world. China is currently home to approximately 1.39 billion people. 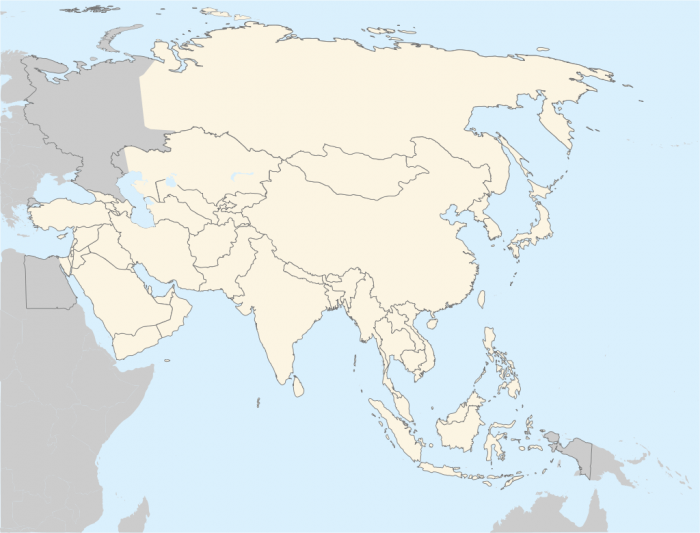 Thanks to the country’s large size it is bordered by many other countries including Russia, China, Mongolia, Myanmar, Vietnam, Nepal, and Bhutan. Civilization in China goes back to around 5000 years ago. China has a long recorded history, being established sometime around 220 BCE, and it was ruled by various ancient Chinese dynasties until the early 20th century. The Republic of China was established in the year 1912, while the People’s Republic of China was established in 1949. The country is governed by a Communist Party, and it is governed from the capital city of Beijing which is populated by around 21 million people. Though standard Chinese is the official language of the country, other languages like Tibetan, Mongolian, Zhuang and Uyghur are also spoken in the country. The country of China is where the fourth longest river in the world, the Yangtze River, is found. The world’s sixth longest river, the Yellow River, is also found in the country. Giant pandas are found near the Yangtze River. China also happens to be one of the world’s largest exporters of cement. India is the second most populated country in the world, and the seventh largest country in the world by land area. The country is home to approximately 1.2 billion people, and bordered by Pakistan, China, Nepal, Bangladesh, Burma, and Bhutan. The capital city of India is New Delhi, and the two official languages of the country are English and Hindi. While the primary religion in the country is Hinduism, Buddhism, Sikhism, and Jainism are also major religions in the country. 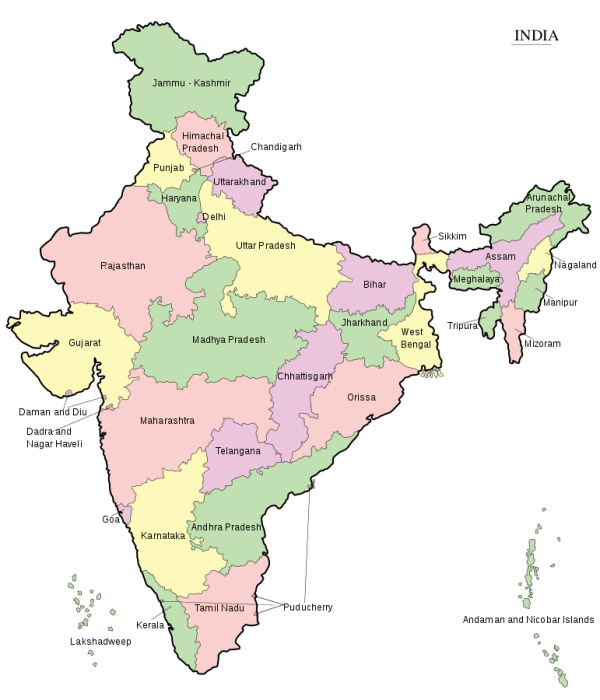 India is divided into 28 different states and seven different territories, each of which are home to many different ethnic groups and cultures. Combined, these different groups speak over 850 different languages. The monsoon season plays an important role in India, bringing water to agricultural operations there. The seasons are sometimes divided into not only summer, fall, winter, and spring, but also the summer monsoon and winter monsoon. Indonesia is a country made out of thousands of different volcanic islands, and home to hundreds of different ethnic groups that speak a wide variety of languages. Some of Indonesia lies within Oceania, as well as in Asia. The population of Indonesia is thought to be around 265 million people, and these citizens are distributed across 736,000 mi.² of territory making the country the 14th largest country in the world in terms of landmass. The region’s primary religion is Islam, and over 87% of Indonesians are Muslim. While there are over 70,000 islands in Indonesia’s territory, it is thought that only around 6000 of these islands are inhabited by people. The world’s largest lizard, the Komodo dragon, is found in Indonesia and they can grow to over 10 feet in length. Pakistan, official name the Islamic Republic of Pakistan, is home to over 200 million people which makes it the sixth most populated country on earth. While the largest city in Pakistan is Karachi, the country’s capital city is Islamabad. The vast majority of Pakistan follows the religion of Islam, with over 96% of citizens of the country being Muslim. The official languages of the country are English and Urdu. Over 21 million people in the country of Pakistan use the internet, which makes it one of the highest internet using countries. Pakistan also has one of the most expansive broadband internet systems in the world. The port of Gwadar if the biggest deep sea ports in the world. The second highest peak in the world – K-2 – is found in Pakistan. The People’s Republic of Bangladesh is home to approximately 163 million people. Bangladesh is the eighth most populated country in the world, and its citizens are distributed throughout the 57,000 mi.² of its territory. The main religion of Bangladesh is Islam, and the vast majority of people in the country are Muslims. The largest city in Bangladesh is also its capital city, the city of Dhake. The main ethnic group within the country is Bengali, which makes up around 98% of the population. Cricket is the most popular sport in Bangladesh, and like India, rainy and cool seasons are also recognized beyond the four main seasons. The Bay of Bengal is the biggest bay on the entire planet, and the country is also home to one of the longest beaches on the planet, Bazar Beach. 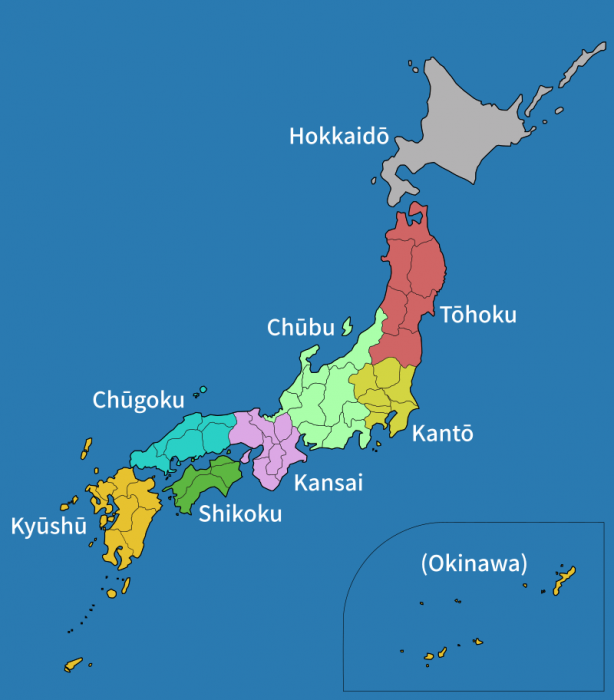 Japan is found in East Asia, and though frequently thought of as one large island, the country is actually an archipelago. There are over 6800 islands within Japan’s territory, with the four largest islands being Hokkaido, Shikoku, Honshu, and Kyushu. These four islands form the vast majority, some 97%, of the country’s land area. Japan is home to around 127 million people, which makes it the 10th most populated country in the world. The capital city of Tokyo is also the country’s largest city, with a population of approximately 30 million people. Japan does not have an official language, though most people in the country speak Japanese, and many also speak English. Japan has no official religion, and is an extremely secular country overall. Most religion in Japan is centered around Shintoism. Japan’s primary exports include electronics and vehicles, and its main imports include water, oil, and food. Japan consumes more fish per person than any other country in the world. The Philippines is a country made out of many different islands found in southeast Asia. There are over 7000 islands found in the Philippines, and these islands cover a total area of around 120,000 mi.², which makes it the 72nd largest country on earth. Despite the relatively small amount of land area in the Philippines, the country is densely populated and home to over 100 million people. 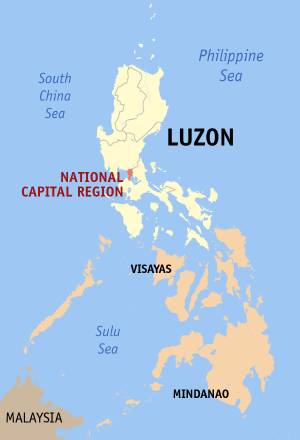 The capital city of the Philippines is Manila, while the largest city in the country is Quezon City. The Philippines is surrounded by hundreds of volcanoes, and it sits upon a geographical area known as the Ring of Fire. There is also an average of 20 earthquakes a day in the Philippines, though most of them are far too small to even be felt. The primary religion of the Philippines is Christianity, with around 90% of all Filipinos following the religion. The Philippines is the fifth largest English-speaking country in the world, with most of its citizens speaking English along with Filipino. The country is also one of the largest producers of coconuts in the world. Vietnam is the 14th most populated country in the world, with a population of approximately 93 million people. By land area, the country is the 65th largest country in the world, with an area of approximately 129,000 mi.². The capital of the country is Hanoi, while the largest city in the country’s Ho Chi Minh City. Vietnamese is the official language of the country. Vietnam is a large producer of knuts, especially cashews, and 37% of all the cashews in the world come from Vietnam. Vietnam is home to the largest cave in the world, Son Doong. Around three-quarters of Vietnamese citizens are either irreligious or practice folk religions. Iran, or the Islamic Republic of Iran, is located in Western Asia and has a population of around 80 million people, making it the 18th most populous country in the world. It is the 17th largest country by land area, with a land area of approximately 636,000 mi.². As the name of the country implies, the official religion of the country is Islam and most of the people who live there are Muslim. Tehran is both the largest city and the most populous city in the country. While Persian is the official language of Iran other languages spoken in the country include Arabic, Kurdish, and Turkic. Iran is thought to possess around 10% of the entire globe’s oil reserves and is estimated to pump around 4 million barrels of crude oil a day. The Republic of Turkey is found in Western Asia, and bordered by countries like Bulgaria, Georgia, Armenia, and Iran. The population of Turkey sits at around 81 million people, making it the 19th most populous country in the world. Turkish Is the official language of Turkey, and around 86% of the population of Turkey speaks it as their first language. Though Turkey has no official religion, the most predominant religion in the country of Turkey is Islam, with around 82% of the population following the religion. Automotives make up a large part of Turkey’s economy. Turkey is also a massive exporter of hazelnuts, being responsible for around 80% of all of the world’s hazelnut exports. Previous Post« Previous How Many Watts Are In An Amp?